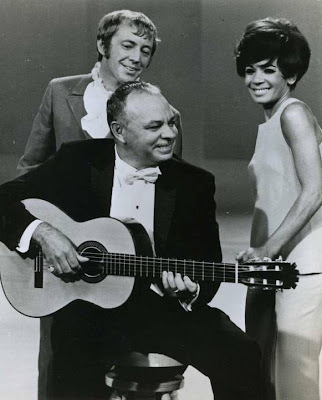 Noel Harrison appeared on the September 13, 1968 edition of the Shirley Bassey Show. Video of the show is now only available on a bootleg DVD. (Noel is pictured here in a publicity shot for the show with Bassey and Almeida). For his first solo performance on the show, Noel sang Santa Monica Pier, the title track from his 1968 album. For his second number, Noel sang 'In Your Childhood', which is also from Santa Monica Pier. The third song performed by Noel during his solo slot was the French song, Madeline. During the show, Noel also performed a number of duets with Shirley Bassey, including 'Gee, it's Good to See You', 'So, What's New', 'Walking Happy' and 'Just one of the Guys'. As the introduction number to the show, Bassey sang Walking Happy and was joined on-stage by Noel. Goldfinger and The Impossible Dream.